We’d love your help. 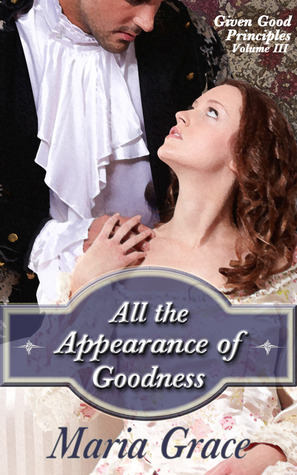 Let us know what’s wrong with this preview of All the Appearance of Goodness by Maria Grace. When Darcy joins his friend, Bingley on a trip to Meryton, the last thing on his mind is finding a wife. Meeting Elizabeth Bennet changes all that, but a rival for his affections appears from a most unlikely quart What is a young woman to do? One handsome young man has all the goodness, while the other the appearance of it. How is she to separate the gentleman from the cad? To ask other readers questions about All the Appearance of Goodness, please sign up. In volume one of Maria Grace's Given Good Principles series, Darcy's Decision, readers are introduced to a grief-stricken Darcy as he copes with the lost of his father and takes on the responsibilities he left behind. In volume two, The Future Mrs. Darcy, readers encounter Elizabeth Bennet as she tries to manage her sisters and keep their fragile reputation in tact. Both books follow Darcy and Elizabeth separately and can be labeled as prequels since they take place before Mr. Bingley's arrival at Netherfield. Volume three is where Mr. Darcy and Elizabeth Bennet finally meet and interact with each other. Mr. Darcy with a little less selfish disdain and Elizabeth with a little more understanding. All the intriguing twists and inventive plot devices Maria Grace manifested in volume one and two of this terrific series set the stage beautifully for this wholly unique variation. A Mr. Darcy who does not insult Elizabeth Bennet at the Meryton Assembly, a Mary Bennet who is soon to be married, and a Wickham that never sets foot in Meryton are only some of the interesting alterations readers will find in this novel. Readers will find some noticeable changes in Louisa Bingley, who is amiable like her brother and friendly with the Bennet sisters, and Mr. Collins, who is a handsome charmer that Elizabeth Bennet finds attractive! Even with the abundance of plot changes to Jane Austen's novel and liberties taken with her characters this book still conveys the essence and charm of Pride and Prejudice. My favorite aspect about this series is how Maria Grace delved into her characters psychologically and emotionally. I enjoyed her portrayal of a Mr. Darcy who battles with social anxiety, a Mrs. Bennet suffering from deep-rooted insecurities and fears of failure, and a Mr. Bennet whose peculiarities range from anxieties with change to a physical need for silence and solitude. It was interesting to see these characters depicted in such a perceptive and sympathetic light. Another element I took great pleasure in with was the focus on close relationships and friendships displayed throughout the novel. It was heartwarming to witness Darcy's father-son relationship with Mr. Bradley and the Bennet sisters close sisterly bonding and connection with each other. So sweet and endearing! While I greatly enjoyed observing the unique character alterations in this series, I wasn't so fond of the fact that some characters started to strongly resemble others. Colonel Fitzwilliam, completely besotted with “his angel,” reminded me a lot of Mr. Bingley, Caroline Bingley's rude and domineering behavior made her seem like a young Lady Catherine, and Mr. Collins behaved very similar to Mr. Wickham with his depravity and schemes. In addition, it felt like the antagonists in this novel, Caroline Bingley and Mr. Collins – who were definitely more devious and manipulative than they usually are – were granted a lot of leniency by the other characters. I found it a little surprising that their malicious actions were tolerated and went uninterrupted for as long as they did. Regardless of my quibbles, I found this inventive and original series to be delightful and diverting! Maria Grace is a captivating and clever storyteller! I highly recommend! I loved it! After reading the first two in the series I knew I would love this engaging conclusion! The story was set up beautifully for this third novel. I would recommend not a long wait time between reading all three, because I found I had to rake my brain to recap some of the events from previous books. I had thought it would be smooth sailing for Darcy and Elizabeth, but I was very wrong! Who would have thought if Mr. Collins had a touch of Wickham in him how he could have been a rival for I loved it! After reading the first two in the series I knew I would love this engaging conclusion! The story was set up beautifully for this third novel. I would recommend not a long wait time between reading all three, because I found I had to rake my brain to recap some of the events from previous books. I had thought it would be smooth sailing for Darcy and Elizabeth, but I was very wrong! Who would have thought if Mr. Collins had a touch of Wickham in him how he could have been a rival for Darcy? Austen's Collins is a pitiable fool, whereas Grace's Collins is a sinister cad. I've never been so frustrated at a character before! Except maybe Grace's Caroline Bingley. I loved reading Darcy and Elizabeth's interactions as well as their inner turmoil, there's still plenty of room for them to conquer their inner prejudices and pride. There were some changes to the main storyline, but this was set up in the first two novels, and I feel they fit well! The tone of this book is very unusual. We start off by repeating the last of Vol. 2 in order to remind us of how Darcy and Elizabeth met. When we left Vol. 2, we were given the impression that there was definite interest between the two parties. I just knew things would be different in Vol. 3 because Wickham had been dispatched in Vol. 2, so there shouldn’t be any problems…right? Oh how naïve I was to believe it would be that simple. I was so amused at how the author lulled me into thinking all would be smooth sailing from here on out. In this third of four books, we still have a very nervous Mrs. Bennet who falls apart at the drop of her handkerchief. She is a bundle of nerves even more severe than in canon. Mr. Bennet has banned sister Mrs. Philips from Longbourn because her visits upset and incite Mrs. Bennet. There is still an undercurrent that has not been made clear. Either that or I completely missed the point somewhere. Darcy and Elizabeth: at times I wondered at their boldness. Elizabeth seemed too bold; Darcy was too tongue-tied. His shyness was near incapacitating. Only if he were doing business or needed to rise to the occasion, then the Master of Pemberley would come forth. OH MY GOODNESS!!! Whew…he did do that well. Charles arrived to look at leasing Netherfield. His sister Louisa was to act as hostess until Caroline barged in and broke up their little respite from her and demanded preference. Caroline: OMG, this was the most outlandish behavior even for her. She was horrid, simpered, complained, turned her nose up at everything and everybody. Darcy finally could tolerate her no longer and helped Bingley man-up and take care of her. I loved seeing Bingley assume his position in his family. It was delicious. We see a new side to Louisa Bingley. She is scheduled to marry Mr. Hurst upon his return from his business to the continent. I really liked her and felt sorry for her as she was controlled and dominated by Caroline. She was upset because Caroline was insisting on going with them on their wedding trip and then living with them afterwards. Lydia…will that girl EVER learn, she was still such a pill and uncontrollable. I don’t have the words. She had already been reigned in somewhat. She was still being shunned by most of Meryton society. There wasn’t too much trouble she could get herself in. However, I still kept expecting the ax to fall. You simply can’t trust her. And she doesn’t see that her actions are so very bad. Jane…awh Jane, she gets her HEA, need I say more. Kitty: I liked this Kitty. She was so creative with her designs and creating fashion gowns for herself and her sisters. She was really coming into her own. Enter Mr. Collins. At first the ladies at Longbourn were impressed with this version of Mr. Collins. This guy was handsome, articulate, well read, well mannered, intelligent and glib tongued [remind you of anyone?]. This was not the toady sycophant that you normally see in canon and most JAFF variations. Having said that…you HAVE to read what happened. I…can’t even describe what went down. NO SPOILERS*** I refused to read any spoilers before reading this and I am so glad I didn’t. OMG!!! I have NEVER seen this sort of action…mystery…suspense…and…I was gasping as I read page after page of ‘I cannot believe this is happening’ type of drama. I am still speechless regarding what happened. OMG!!! How creative and I do so love surprises, but this was beyond anything I could imagine. Got me good!!! I loved it. Problems: minor editing. However, the shifting POV drove me crazy. I don’t mind being in more than one head and trailing several thought processes. There was Darcy, Elizabeth, Mr. Bennet, Colonel Fitzwilliam…it got pretty crowded and messy. The problem was one section would this person’s thoughts, then the next section would be another person’s thoughts during the same time period. I kept flipping back and forth trying to decide who was talking and where we were on the timeline. The jumping around, back and forth, was just too disconcerting. Other than that, I LOVED this story. The author was so creative in taking Austen’s dialogue and then having the most unlikely person deliver it. It was so surprising to see those favorite speeches in someone else’s mouth…I had to laugh. All the Appearance of Goodness is Volume III in Maria Grace’s Given Good Principles series of Pride and Prejudice variations. The series began with Darcy’s Decision, in which a young Fitzwilliam Darcy comes to terms with his responsibilities as master of Pemberley, and The Future Mrs. Darcy, in which Elizabeth Bennet must take control of the household and rein in her foolish little sister Lydia before she ruins the Bennet family’s reputation. In this installment, Darcy and Elizabeth finally cros All the Appearance of Goodness is Volume III in Maria Grace’s Given Good Principles series of Pride and Prejudice variations. The series began with Darcy’s Decision, in which a young Fitzwilliam Darcy comes to terms with his responsibilities as master of Pemberley, and The Future Mrs. Darcy, in which Elizabeth Bennet must take control of the household and rein in her foolish little sister Lydia before she ruins the Bennet family’s reputation. In this installment, Darcy and Elizabeth finally cross paths, as he accompanies Mr. Bingley to Netherfield Park. With his vicar and trusted advisor Mr. Bradley at his side, Darcy hopes his time in the country will allow him to practice his social skills, but he is caught off guard when he gets lost on the Bennet’s property and encounters a lively Elizabeth. It’s not long before the Bennet sisters have befriended Darcy, Bingley, and Bingley’s sister Louisa, and Jane Bennet immediately catches the eye of Darcy’s cousin Colonel Fitzwilliam. But things become chaotic as the Bennets begin to plan Mary’s wedding, Caroline Bingley arrives with an arrogance and outspokenness that would give Lady Catherine a run for her money, and Mr. Collins comes to check out the estate he will one day inherit and immediately sets his sights on Elizabeth. Mr. Collins has good looks and good manners, and Darcy soon realizes he has some competition in his quest to win Elizabeth’s affections. It soon becomes apparent that Mr. Collins may not be what he seems, but Darcy’s inability to express his thoughts and feelings doesn’t do much to help his cause either. A confused Elizabeth is forced to determine which man has all the goodness and which only has the appearance of it. All the Appearance of Goodness was so different and so exciting that after two cups of tea, I was already more than halfway through the book, and I dismissed my plans for the rest of the day because I just had to see how it all played out. Watching Mr. Darcy and Mr. Collins try to outdo one another was amusing at first, but I was surprised (and delighted, of course) when the story took a more sinister turn. I loved that Louisa Bingley was so likeable and Caroline Bingley much more despicable in this variation, and their confrontation is an absolute must-read. I found it a little odd that Bingley, as amiable as ever, was relegated to the background and spent most of his time with Kitty and Lydia, but it worked here. But mostly I enjoyed having no idea how the expected happily ever after would be achieved. Maria Grace has a knack for shaking things up in her variations, as evidenced by her latest novel, Remember the Past (which I loved). I don’t know why it took me so long to continue this series, but I’m so glad I did. There is a lot that happens in the first two volumes that shape Grace’s versions of Darcy and Elizabeth, so readers will want to read them before picking up All the Appearance of Goodness. From Grace’s original characters like Mr. Bradley to her portrayal of characters we already love to hate, All the Appearance of Goodness was a pure delight. I immediately picked up the next book in the series, Twelfth Night at Longbourn, so stay tuned for my review. I liked the 1st and 2nd books in this series much more than the final book. Mr. Collins must stand in as the resident villain, Wickham having been disposed of in book 1. I must say he's more evil than Wickham and that's about the highlight of the book. Col. Fitzwilliam makes an appearance and unfortunately he woos and wins Jane Bennet, leaving Bingley to mill about like a fool and keep company with Kitty and Lydia. Luckily no romantic notions form there. Caroline Bingley is dealt with quite nice I liked the 1st and 2nd books in this series much more than the final book. Mr. Collins must stand in as the resident villain, Wickham having been disposed of in book 1. I must say he's more evil than Wickham and that's about the highlight of the book. Col. Fitzwilliam makes an appearance and unfortunately he woos and wins Jane Bennet, leaving Bingley to mill about like a fool and keep company with Kitty and Lydia. Luckily no romantic notions form there. Caroline Bingley is dealt with quite nicely (for once!). But it all turns quite gothic at the end. What I missed most in this variation was the sisterly interaction between Jane and Elizabeth... neither one talks to the other about her feelings...nor are we privy to many of their thoughts. What I disliked most was reading other characters talk about events instead of the allowing the reader to witness the events firsthand. For instance, we don't realize that Darcy has sought Lizzie's hand from her father until Darcy is talking about it to Bradley. I would have preferred to read the actual scene as it unfolded but was sadly denied. Another winner from Maria Grace. This series of three books can boast that each is as compelling as the other. Not one is my favorite. It is a compliment to the author that she was able to set a high standard of storytelling and was able to reach it again and again. Well done! The third in the series brings our characters together and in some interesting pairings. Mr Collins is even more of a "bad" guy than ever and Caroline Bingley was written perfectly awful. Our happy couple finds the love in their hearts after they are willing to take a chance. This book is the third volume and longest in the trilogy, Given Good Principles, by Maria Grace. Volume I & II are both prequels to Pride and Prejudice with Volume I focusing on Darcy and his life prior to his trip to Herefordshire with Charles Bingley. Some background of the Bennet family and the reputations of Kitty and Lydia comprise the story for Volume II. I highly recommend reading both before reading Volume III. In the beginning of All the Appearance of Goodness, Darcy and Lizzy meet This book is the third volume and longest in the trilogy, Given Good Principles, by Maria Grace. Volume I & II are both prequels to Pride and Prejudice with Volume I focusing on Darcy and his life prior to his trip to Herefordshire with Charles Bingley. Some background of the Bennet family and the reputations of Kitty and Lydia comprise the story for Volume II. I highly recommend reading both before reading Volume III. In the beginning of All the Appearance of Goodness, Darcy and Lizzy meet for the first time. (And in a most unusual way) I loved this scene and the repertoire between my two favorite characters. It was very well done and brought many smiles. Another good thing about it was that it made for some nice references later in the book. George Wickham is mentioned but is not in this story as he was dealt with in Volume I. He does have a replacement of sorts, in the form of Mr. Collins, the handsome and charming clergyman. (Yes, you read right!) Lizzy is true to character here as she is, at first, taken in by his looks and eloquence of speech. Lydia, not true to character, is not, and has an intense dislike for their fetching cousin. She even tries to convince Lizzy of her reasons for mistrusting him but Lizzy will not listen. What could Lydia possibly know…except maybe a bit of jealousy? Darcy’s good friend and now vicar, Mr. Bradley, plays a big part again in this volume. He still is the mentor that Darcy needs and is pivotal in helping him see things without prejudice. This character that Ms. Grace has created is one I much love and of whom I would like to read again. Louisa Bingley is unmarried but betrothed. Her personality is much improved and even likable. Mary has a much bigger role and a good one. It was great to see her happy and having good things happen to her for a change. Some of the other characters are matched up much differently than in the original book, but it made for fun reading. I loved the allusions to a relationship that might be developing for Kitty! You will never guess the fellow and I won’t spoil the surprise! Darcy and Lizzy have misunderstandings of which their relationship is renowned. That makes the understanding between them all the better when it does happen. Toward the end it gets extremely intense. I couldn’t put the book down. Anyone that loves P & P retellings will want to read this book! It is most excellent! Thank you, Maria Grace, for these three volumes. I am hearing rumors that there may be a fourth! I hope that is true! I was given an ARC eBook by the author for an honest and fair review. And in the 3rd book Mr. Darcy and Lizzy Bennet finally meet. Mr. Darcy is marriage minded and in search of a young woman who will fulfill the duties of a proper mistress to Pemberley and enjoy country society. He first encounters Lizzy as she returns from a tenant visit and is walking in the woods. He on the other hand is lost and tangled in a raspberry bush. This book introduces us to a kind, caring and thoughtful Louisa Bingley, away from Caroline and welcome to new friends. Bradley joins Darc And in the 3rd book Mr. Darcy and Lizzy Bennet finally meet. Mr. Darcy is marriage minded and in search of a young woman who will fulfill the duties of a proper mistress to Pemberley and enjoy country society. He first encounters Lizzy as she returns from a tenant visit and is walking in the woods. He on the other hand is lost and tangled in a raspberry bush. This book introduces us to a kind, caring and thoughtful Louisa Bingley, away from Caroline and welcome to new friends. Bradley joins Darcy & Bingley in Meryton and is thrilled to meet his old friend Bennet as well as the Bennet ladies who he knows well from his correspondence with Madalyn Gardiner. He is also visiting with Meryton's deacon to consider him for the post at Pemberley. The deacon is engaged to Mary Bennet. To add to the excitement Mr. Collins has come to call upon the Bennets. Mr. Bennet is desirous of acquiring a mortgage to improve Longbourn and requires Collins' approval. This is not Mr.Collins of P & P but a Collins / Wickham chimera; obsequious, attractive and duplicitous. The irony is that Lydia alone recognizes the danger he represents but her protestations are dismissed as malicious jealously. While the Bennet sisters are enjoying Miss Bingley's company and Darcy & Bingley acquaint themselves with Netherfield and Meryton, Mr. Collins slimes his way into the Bennet family. He with the assistance of a nasty Caroline Bingley attempts to turn Lizzy irrevocably against Darcy. Resulting in Lizzy hiding away from everyone. Meanwhile Col. Fitzwilliam (ret.) is wooing Miss Jane Bennet and Bingley is just a happy go lucky fool. When Mr. Collins fails at his wooing for Lizzy he appeals to her father and suggests he will agree to the mortgage for Lizzy's hand. When that is rebuffed he attempts to compromise Lizzy. The author reminds us endlessly of the perilous position of the young lady in Regency England and how her wants and needs could be easily ignored to soothe society. I was intrigued and delighted by the many twists Maria Grace puts in this story. Her pairing of couples is fun, and Darcy has some competition vying for Elizabeth’s attention. Of all people, it’s Mr. Collins! A handsome and charming Mr. Collins at that! But appearances can be deceiving. Colonel Fitzwilliam is in Meryton also staying a Netherfield. He is retired from the military and is on the look out for a wife. Could he possibly be interested in any of the Bennet girls? Mr. Bradley, Darcy’s vicar accompanies Darcy to Meryton. He's come hoping to persuade Mr. Pierce to become the curate in Derbyshire. I quite enjoy Mr. Bradley's subtle way of giving out advice! I also truly liked Louisa Bingley. She is not yet married to Mr. Hurst, but they are engaged. She has accompanied Bingley to Meryton to be mistress of Netherfield. Louisa has more of Bingley’s disposition, and she is not as close to Caroline as she is in the original. I enjoyed reading All the Appearance of Goodness. It’s a fun, surprisingly mixed up Pride and Prejudice variation! I would encourage you to read the first two volumes first. This third volume in the series follows Darcy and Elizabeth from first meeting to marriage. After patiently awaiting this third book I was pleased, but still yet wanting more to the story. Will there be a fourth? I enjoyed how Maria Grace creates a quirky banter between the characters and changes the plot quite significantly. I was actually surprised when certain characters ended up with new matches, and was content to say it worked. I really liked this Darcy and his attention towards Elizabeth. This third volume in the series follows Darcy and Elizabeth from first meeting to marriage. After patiently awaiting this third book I was pleased, but still yet wanting more to the story. Will there be a fourth? This is my favourite of the series, because finally we see Darcy and Elizabeth togheter. Someone might argue that some characters are really different from the original and somehow it's true: some bad characters are fare worse than the original and some good characters are even better. But what is important to me when I read a P&P variation is that Elizabeth and Darcy are the same, and they are. This novel was an enjoyable reading and I can't wait to begin the fourth and last volume. I preferred the second book to the third, I think because there was a lot more character development happening. Still, this is a good end to the series. All throughout reading this trilogy I've maintained that it should be one book rather than 3 novellas. I still stand by this, as it would have been nice to see the story intertwined and in one larger volume. Still, a surprisingly good read! Not one of the good P&P variations. Although I did like that Mr Collins was made to be a sly villain. However there were large sections that were stagnant. Though the plot sounded interesting I didn't feel the author carried out its promise. Feel free to skip this one. After reading the second installment of this series and needing relief from such a downer of a story, thank God this third book contained some joy and humor. I did find it hard to believe that Elizabeth rebounded so dramatically from the conclusion of the second book, and was instantly cheerful and witty with her Darcy encounter at the start of the third book. She goes from hopeless and anxious to the point of illness, to bright and breezy and carefree in the blink of an eye. Oh well, such is artistic license. I also found the pairing of Jane and Colonel Fitzwilliam, while satisfying, went along almost too easily. Where was the angst all the others had to contend with? This author writes well. The treatment of Mr. Collins' character was a clever departure from canon. The disposition of Caroline Bingley was nice. I have to wonder, though, what is wrong with Mrs. Bennett? She is given a weakness of mind in these stories that is extreme and makes it seem a miracle that she endured the birthing and raising of five children. Some situation in her younger years that affected her negatively is mentioned, but in these stories she almost seems like she should be in Bedlam. I've waiting years for Caroline Bingley to get her comeuppance and Maria finally gives me what I want...excellent. A good 3rd book in the series, I loved that Darcy was more approachable in this book and that Mary finally gets a good story. Mr Collins was definitely a surprise as he's written in this version and it made a lovely change that he wasn't portrayed as the oily sycophant rather a charming one. Threw me a bit the relationships changing but as long as Darcy gets Elizabeth I'm happy. This series was incredible. I finished all four books in about 24 hours. (I was on holiday!). I won’t say more but even if at times it’s not of the perspective of odc it’s still good. I’m now going to read all of the authors other books. One of her new acquaintances seems to be all that is good and proper, another one does not give a good impression, how to get things right? It will take some mistakes and learning some hard lessons for Elizabeth to find the truth. Once I got past the fact that after the first book, the author is no longer following Jane Austen's plotline, and is matching people up completely differently, I could sit back and enjoy the story. This is a great retelling of a part of the Pride and Prejudice story. I really enjoyed this retelling. Maria has become one of my favorite authors. I have read this book three times already. It's so good I just keep coming back to it. This book starts out with Mr. Collins staying at Longbourn, although instead of being slow and gross he is pleasing and handsome. Elizabeth is immediately drawn to him. Mr. Darcy, who is staying with his friend Bingley, now finds a rival for his affections. Elizabeth's thoughts turn to marriage after her sister Mary's wedding, and she now finds herself being courted by two eligible gentlemen. But one h Love it! It is an absolutely delightful and intuitive look into “what might have been”, had things happened just a little bit differently than the events in Pride and Prejudice. Read full review in the 2013 May issue of InD’tale Magazine. Anticipating more great reading as the series further unfolds with Vol 3! So good, did not want to put it down!!! Though Maria Grace has been writing fiction since she was ten years old, those early efforts happily reside in a file drawer and are unlikely to see the light of day again, for which many are grateful. After penning five file-drawer novels in high school, she took a break from writing to pursue college and earn her doctorate in Educational Psychology. After 16 years of university teaching, she ret Though Maria Grace has been writing fiction since she was ten years old, those early efforts happily reside in a file drawer and are unlikely to see the light of day again, for which many are grateful. After penning five file-drawer novels in high school, she took a break from writing to pursue college and earn her doctorate in Educational Psychology. After 16 years of university teaching, she returned to her first love, fiction writing.